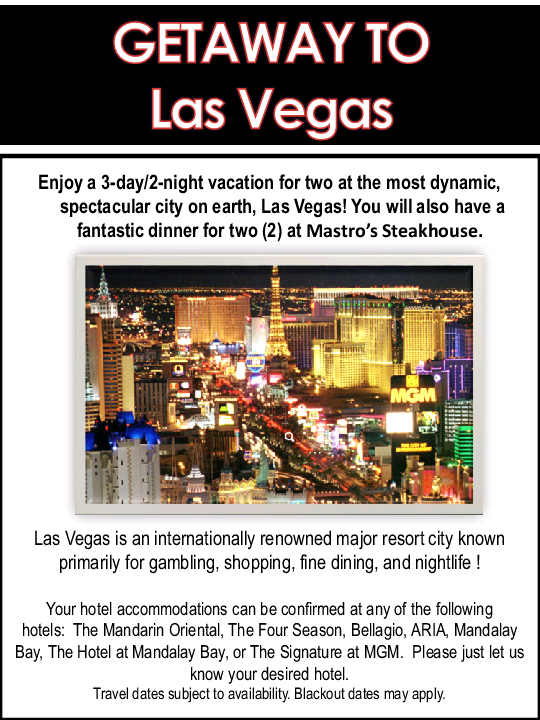 Mandalay Bay, The Hotel at Mandalay Bay or The Signature at MGM. No cash substitute for prize. These sponsorship are offered as underwriting opportunities for those who wish to participate in a special way. Please submit your Hi-Res logos to Linda.Quentzel@gmail.com by 2./22./19. 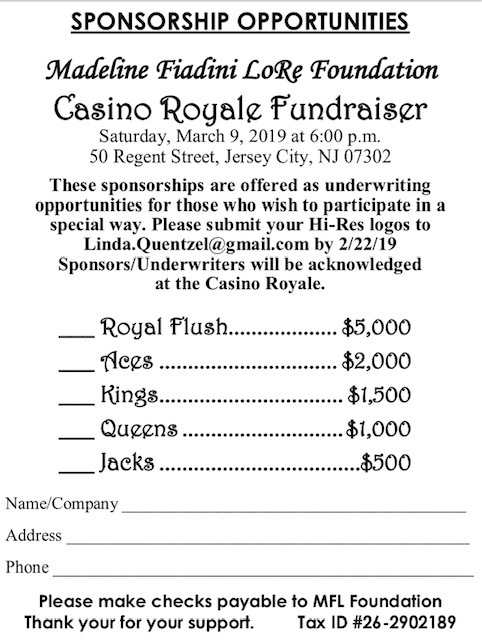 Sponsors/underwriters will be acknowledged at the Casino Royale. Lots of great prizes to win! FUN IN THE SUN: Straw Beach Bag, Embellished Flip Flops, 2 Beach Towels & Towel Clips, Etc. COMPLIMENTARY parking across from Jersey Avenue Light Rail AT Jersey City Medical Center - 355 Grand Street. And of course, our friends Uber and Lyft! For many years the Chairperson of the Madeline Fiadini LoRe Foundation for Cancer Prevention, Madeline LoRe, spearheaded major projects in her community, Bayonne, for the health and well being of its citizens. She has brought desire and innovation to the cause of ensuring that the people of Bayonne will always avail themselves to the highest quality of health care services. 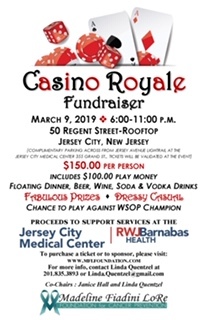 As a result of her volunteer efforts, two major centers were opened at the Bayonne Hospital in 2006: The John Fiadini Outpatient Oncology Center and The Madeline Fiadini LoRe Women's Center. When the Bayonne Medical Center, (formerly Bayonne Hospital), became a for profit institution, Madeline looked to the community once again to identify their needs. The state of the economy coupled with the high unemployment rate quickly brought a group to the forefront. This group is the working poor, (our constituency), uninsured people over the poverty level. Once again, with the focus on cancer prevention, Madeline rallied her supporters behind the plan to bring much needed cancer screenings to those who could not access those tests. The result was the establishment of the Madeline Fiadini LoRe Foundation for Cancer Prevention in June 2008. As we have grown and extended our affiliations, so has our demographic base. We offer services to anyone in the surrounding areas who can access the hospitals that have partnered with us: Jersey City Medical Center/RWJ/Barnabas Health, CarePoint Health, Metropolitan Family Health Network, Hudson River Radiology, and Bayonne Dermatology Associates. "Our Mission is to make cancer prevention programs available to the community we serve. Our Focus is to grant access to the tests and/or screenings necessary to those individuals who may otherwise be denied. Our hope is to enrich the Life of every individual in need, one at a time." It is our hope to make Cancer tests and/or screenings available to this underserved constituency. These individuals are uninsured and above the poverty level with no access to the costly tests and/or screenings. It is the Foundation's goal to make these tests available to those individuals. The cancer tests and screenings we have identified are: Mammography, PSA, Oral Cancer, Skin Cancer, Cervical Cancer, Colonoscopy. Colposcopy, and Anoscopy. Health Care. It's the hot topic on many of our minds. More people are unemployed. The numbers are staggering. It is not surprising that elective screenings are among the first "luxuries" to be cut from a family's household budget. Unfortunately this decision could be catastrophic if a preventable cancer results from a test or screening not taken. As a three time cancer survivor it is my passion to prevent as many cancers as I possibly can. Sometimes all it takes is a simple test. Not having the money to pay for such a test is no longer a viable excuse. The Madeline Fiadini LoRe Foundation for Cancer Prevention was established specifically to address those individuals. At the very first MFL Foundation Board meeting, our Board recognized a need in the community. With our diligent Board of Trustees, we have set policy for eligibility and access to the tests/screenings. Funding to support our efforts comes from grants, donations and from several fundraising events throughout the year. Visit us at www.mflfoundation.com for the application. The task before us is monumental but we believe we can make headway, one case at a time. It only takes one person to tell a friend about us. You may be saving their life.